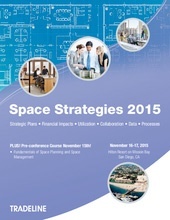 Keith Fentress and Alison Jones presented at the Tradeline 2015 Space Strategies Conference on November 16-17. For the second year in a row, the Tradeline conference was a great experience - a well-run conference that included innovative speakers on the leading edge of space transition. This year, we presented on Space Reduction Initiatives and highlighted best practices that we have seen through our experience. We hope that attendees left with a better understanding of how to transition traditional offices to a more mobile and collaborative work environment.